The Friends of the Rideau, a non-profit voluntary organization, has undertaken to produce scanned CD copies of Parks Canada manuscript reports that deal with subjects related to the Rideau Canal World Heritage Site, with the intention of making them more readily available to the public. Previously these unedited research reports were available for consultation only at the Library and Archives Canada, and at provincial archives across Canada, where they are on deposit as federal government archival documents. The Parks Canada manuscript reports are in the form of either a bound hard-copy (Parks Canada, Manuscript Report Series), or in a microfiche format (Parks Canada, Microfiche Report Series). To date the Friends of the Rideau Canal, with the permission of Parks Canada, have scanned a number of Rideau Canal reports into a CD Book format (see www.rideaufriends.com), including two reports prepared by Passfield to meet Parks Canada program needs. 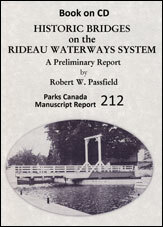 Robert W. Passfield, “Historic Bridges on the Rideau Waterways System, A Preliminary Report” , Parks Canada Manuscript Report Series No. 212, 1976, 129 pp., illustrated. Book on CD (Adobe PDF), produced by Friends of the Rideau, 2009. This report comprises an investigative survey level photo-recording of the historic bridges extant on the Rideau Canal National Historic Site of Canada undertaken in July 1974. It locates, dates, and describes the bridge structures, and identifies them according to their general type, configuration, and materials of construction, with the inclusion of a brief history of the bridge site and the bridge structure. A total of 26 historic bridges, both road and railway, are treated. The report is illustrated with a photo of each structure, and historic engineering drawings of several of the older types of swing bridge structures. Included are reconstructed timber swing bridges (1865-1866 design), a Scherzer Rolling Lift Bascule Bridge, a Strauss Trunnion Bascule, a number of pony truss swing bridges, a vertical lift bridge, and plate girder swing bridges. This CD Book is fully searchable, and duplicates the original Parks Canada Manuscript Report text and illustrations. It has been enhanced with the addition of several new maps. 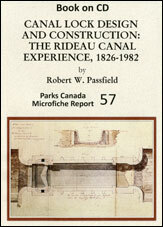 Robert W. Passfield, “Canal Lock Design and Construction: The Rideau Canal Experience, 1826- 1982", Microfiche Report Series No. 57 (Canadian Parks Service, Environment Canada, 1983), 482p., illustrated. Book on CD (Adobe PDF), produced by Friend of the Rideau, 2010. This report comprises a structural history of the design evolution and construction of the locks on the Rideau Canal. It was prepared originally to serve as a reference work for Parks Canada in maintaining, operating, restoring, and interpreting the locks on the historic Rideau Canal National Historic Site of Canada, and now is available for sale to the public unabridged. The design of the stone masonry locks is analyzed in terms of contemporary canal construction practice and empirical design formulas; and the design, materials, and method of construction of the locks are described and explained in detail. All subsequent changes and design modifications in the sluice mechanisms and lock gates, from the opening of the canal through to 1982, are identified, dated, illustrated, and explained in terms of specific problems encountered in operating the canal. In its entirety this report constitutes a case study of empirical canal engineering in the early 19th century, in which the canal construction technology is placed within an international context embracing Canada, Great Britain, and the United States. The CD book text is illustrated with over 90 period engineering drawings, historic photos, and contemporary photos, reproduced in high resolution images. The text is fully searchable, and duplicates the original manuscript report. The Rideau Canal (1826-1832) was constructed by the British Army Corps of Royal Engineers under Lt. Col. John By as a river steamboat navigation with 47 stone masonry locks, and accompanying high dams and waste weirs, on a 125 mile (202 km) slackwater system stretching from the Ottawa River at Bytown (Ottawa) to Kingston on Lake Ontario. It was constructed to provide a secure interior water communication on which the British Army could move troops, ordnance, munitions, and supplies inland in wartime from the ocean port of Montreal to the Great Lakes, independent of the exposed upper St. Lawrence River navigation.